I call upon Her Spirit as she calls upon mine, a faithful servant to Human kin, since the beginning of Time. Of the Cupressaceae (Cypress) clan, She is rooted around Pachamama. She circles the Northern Hemisphere, from the Arctic to as far South as Tropical Africa; from Ziarat, Pakistan to eastern Tibet, up to an altitude of 16,000 feet (4,900 meters) in the Northern Himalayas, as well as in the mountains of Central America. She has many names: Hapusha (Sanskrit), Kuei (Traditional Chinese Medicine), Hab-ul-Bruta in Persia, Arkevthos in Greece, Pojjevelnik in Russia. On Turtle Island, Sammapo (Shoshone), Paai (Washo), Wapi (Paiute) and countless others. as the Sacred One, Miskwawak. hears our deepest prayers, lifts them up, and amplifies them into the Universe. to the Source, our "Gates of Vitality", the Kidneys, where we store prenatal and postnatal jing, the essence of qi. They store the primordial yin and primordial yang that govern and nourish the whole body. The Kidney Fire provides the driving energy, determination, and resolute will power (zhi) needed to overcome obstacles. Kidneys work in harmony with the Heart to help focus our mind and cultivate the perseverance necessary to manifest our goals. Kidneys house the emotion of fear. Healthy response to fears call us to attention and awareness. Constant chronic fear, or undigested suppressed fear, freezes us, and we may feel stuck and hopeless. Gently relax, open the waters, and allow yOur energy to flow with healing pranayama, grounding practices, and restorative Yoga. Breathe in Self Awareness and Self Acceptance. Take effective action. Keep the waters flowing. Kidneys govern the ears. Be still. Listen. Listening is a practice of deep receptivity. Listen to the wisdom voice within. Listen deep to the wisdom in the land. We are Pachamama, a drop of Ocean. Feel the aquifers under the ground, our Beloved Mothers' blood pulsing deep and True, water millions of years old. We are in this deep season of Winter. In TCM, Winter is governed by the element of Water and the Kidneys. Bless this water that breathes the Cosmic currents, the cycle of respiration from Earth - Trees - Sky - Clouds - Rain - Snow - Rivers - Lakes - Ocean. Water is Life. Water is Alive. Water carries intelligence and memory, and is able to communicate, to Heal. Even as we urinate we honor our offering in this Cosmic cycle of respiration. We open our water gate downwards, we expel water that has kissed the innermost chambers of our body. It carries the imprint of our memories, dreams, prayers, and carries what needs to be released. Even with your urine, offer Gratitude and a prayer deep into our Mother Earth. May our life may be useful for All. May the Earth be Healthy and Healed. May all Beings enjoy Abundance. Juniper is stimulating, indicated for chronic conditions associated with debility and lack of tone in the tissues. Traditionally used to treat elders or those with chronic diseases, to restore tone to tissues and organs. Stimulates Kidney tissues. Antiseptic. The volatile oils are said to be irritating; they dilate the glomeruli of the kidneys causing mucus discharges from the membranes. To balance this stimulating drying nature, combine with demulcent and emollient herbs that soothe and soften body tissues (Mallow, Slippery Elm, Icelandic Moss). Specifically indicated for exhausted kidneys, resulting in extensive edema, with nervous system weakness, incontinence, and heart symptoms. In Western medicine, the kidneys regulate water metabolism, stabilizing the Heart and Blood Pressure. Powerful for steam baths, sweatlodges, saunas; opens body for purification. Specific for when damp clogs the body, especially in the lungs, it must be eliminated through cough or sweat. 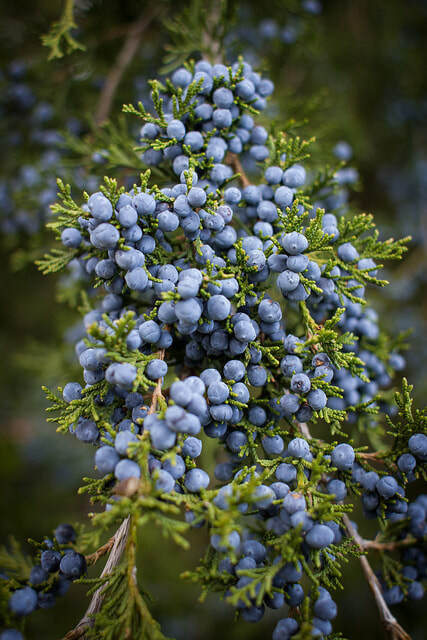 Juniper is a simple favored by one of the early eclectic physicians, William Salmon (MW). He describes it as a remedy for cold, damp, phlegmatic conditions. Inhale steam for respiratory infections, colds, asthma, bronchitis. For cough, traditionally powdered bark mixed with honey. Dena'ina Athabascans drink juniper berry tea for sore throat and colds. It is said that when Cholera arrived in the 1850s among the Lakotas, many tribal people died. Red Cloud, who later became a famous Lakota chief, tried many treatments for the disease, including a decoction of juniper leaves which was drunk and used in bathing. It was said to be a cure. Juniper is indicated in poor peripheral circulation, stimulating circulation to the extremities. She brings warmth to the coldness of limbs, relieves cramps and numbness, and restores strength to nerves and muscles. Macerate berries in oil (for massage) or in Witch Hazel (for liniment) for strained muscles or arthritic aching joints. Topical treatment (poultice or liniment) or steam indicated for joint pain, rheumatoid arthritis, swollen joints, nerve, muscle, and tendon disorders. Specific for stiff, contracted, cramped, chilled muscles. Uterine stimulant, improves uterine tone and menstrual flow. Zunis toasted branches for tea, to relax the muscles before childbirth began and in after birth to ease pain and speed the recovery after delivery. Sprinkle a finely powdered form (of any part of Juniper) on wounds to prevent or heal infections. Use a strong decoction to topically wash skin disease and sores, including eczema, psoriasis, and skin conditions. Stimulates digestion. It is thought to stimulate secretion of hydrochloric acid and pepsin, facilitating digestion. Chewing the berry stimulates digestive juices, and is apparently so effective that blood sugar will dive within 1/2 hr of the berry. In TCM, kidneys are said to rule over the skeletal structure and function of the body, and are responsible for healthy teeth, the production of healthy bones, and manufacturing blood and bone marrow. Kidneys are said to rule Brain and spinal cord, thus intelligence, reason, perception, memory. The ash of the Branches are said to be high in digestible calcium. The Navajo burn branches, collect the ash, and stir it into traditional dishes. The lye is said to make corn (hominy) more digestible. It is reported that every gram of ash contains 280-300 mg of Calcium. Enjoy Her in sauce, jam, jelly, conserves, and marinates. Berries traditionally used as sauce for wild meat. Branches traditionally used for as a bed for cooking meat. Add juniper branches to alder chips for smoking fish and meat. Germans love the berries in Hasenbraaten, Rehbraten, and Schwabisches Sauerkraut. It is said that traditionally, many native tribes ground the berry, cooking it as mush and into hotcakes. Internally: Tincture, elixir, syrup, tea. Dosage is small, recommended blending into a formula. Balance drying effects by combining it with demulcents. North and Western Europe use Juniper as a base for beer. In the 1500s Dutch pharmacist created a 'new' inexpensive diuretic using the juniper berry, called it 'gin', from the French word for juniper - genievre. The green immature female fruits are highest in essential oils and best for flavoring alcohol spirits (green berries not recommended for medicine or food). Wacholder Branntwein is popular Juniper berry flavored spirit in Germany, Austria, and Switzerland. In France, Vin de Genievre, and Juniper Hippocras are made with the berries. Laplanders make a beer flavored with juniper berries, and also add juniper berries to flavor spruce beer. Juniper Berries are a great source of wild yeast, the whitish 'blush' that covers the dark blue berry. Use to activate sourdough starter or add wild yeast to alcoholic brews. Junipers are Dioecious; they have male and female species. If tree does not have any berries, probably male. Female cones (berries) are the most favored part. The berries take 2-3 years to mature, and when ripe are blue-black with whitish bloom. Pick berries fall / winter. Some junipers are suceptible to Gymnosporangium "rust" disease, and can be a serious problem for those growing apple trees, the alternate host of the disease. The berries are a wonderful food source for wildlife. spherical structure (pine seeds are encased in a woody elongated strobilus." ~ (Nov. 7th, 2017, fb thread via Ancestral Plants). Suitable to cold, damp, and wind, but contraindicated by some herbalists in acute, hot, and irritable states. For respiratory use, an infusion of berries is highly recommended, as Essential Oils are released. Infuse 1 oz berries in 1 pint boiling water. Dose: 1/2 - 2 oz. For kidneys and urinary tract, tincture is recommended, as it extracts resins first; Tincture 1-10 drops. Combines well into spagyric tincture, 20-50 drops. Not recommended for extended use; 6 weeks maximum. Contraindicated internal use in pregnancy, as it is a uterine stimulant. May be taken during labor and delivery. It is said that Juniper is highly irritating for Kidneys, and should not be used over long periods (see dosages). Stephen Buhner refutes these claims, for in his experience Juniper is healing and deeply beneficial for Kidneys. Use with awareness, attentive to the Kidneys (lower back sensation, sensations in the knees) and the color / smell of Urine. Avoid internal use when there is acute inflammation, blood in the urine, and kidney disease.